Jim moved to Oriental in 2007. He bought a waterfront home on Styron drive. 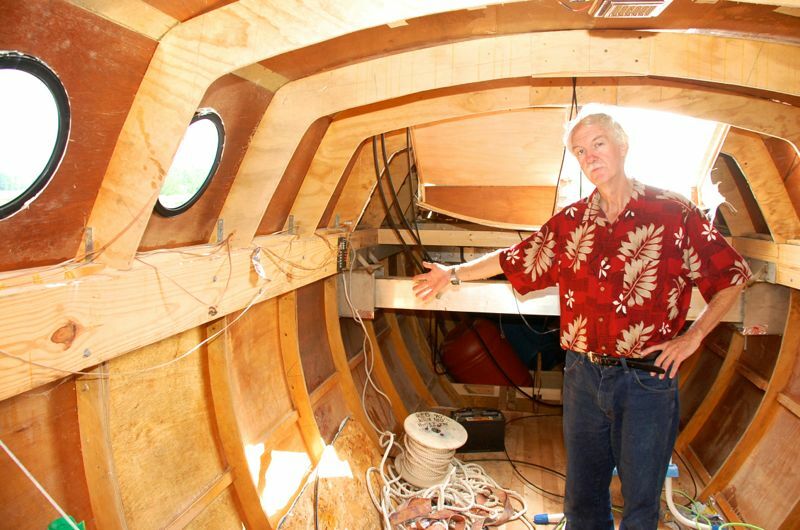 He set up a shop in his garage and in 2010 started building what he hoped would be the most fuel efficient power boat in the world. Though he’d built small craft as a young man, he had never built a vessel this size. He describes his boating experience as traveling “hundreds of miles” in boats, none of them offshore. Still, he knew exactly what he wanted to create. As Jim saw it, the trouble with most large trawlers and power cruisers is they were all the same – heavy, slow and fuel thirsty. The solution was to give the world the exact opposite kind of boat – something large, lightweight, fast, and fuel efficient. That meant turning his back to what had already been done. It meant ignoring conventional wisdom. He says, “I wanted to operate from ignorance. I did not want to be influenced by other designers. I wanted to keep the underwater dimension of my design narrow to define the Planing Principles.” What Jim calls “Planing Principles” is also known as Hull Speed. It is a mathematical limit to how fast a displacement hull – a hull that rides in, not on top of, the water – can travel. Audacity’s narrow hulls, with which Jim hopes to defy the principles of Hull Speed. Hull Speed is the maximum theoretical speed a non- planing hull can travel through the water. Jim felt his design could do better. So far, Audacity has been towed by a skiff but has not been able to break this law of fluid dynamics. The frames, the wood equivalent of ribs in a person, were built of hardware store plywood. He used long strips over softwood timber to connect the frames. 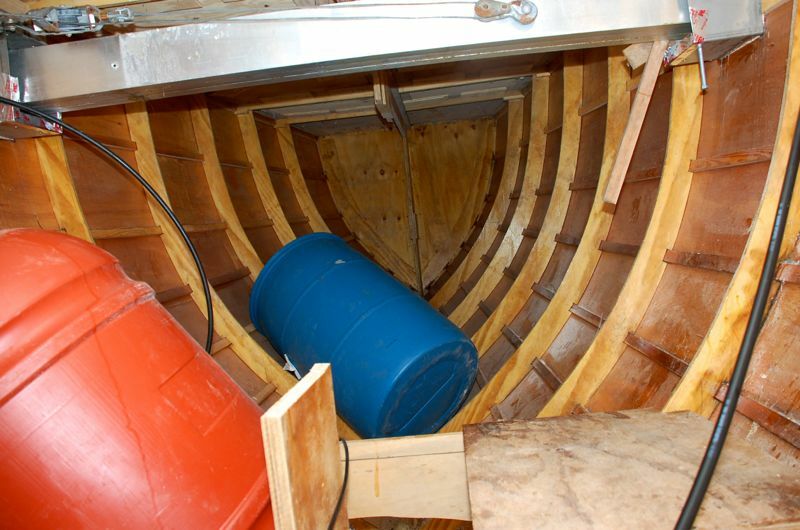 The vessel’s outer skin consists of 1/8” luan plywood – “doorskins” he says. 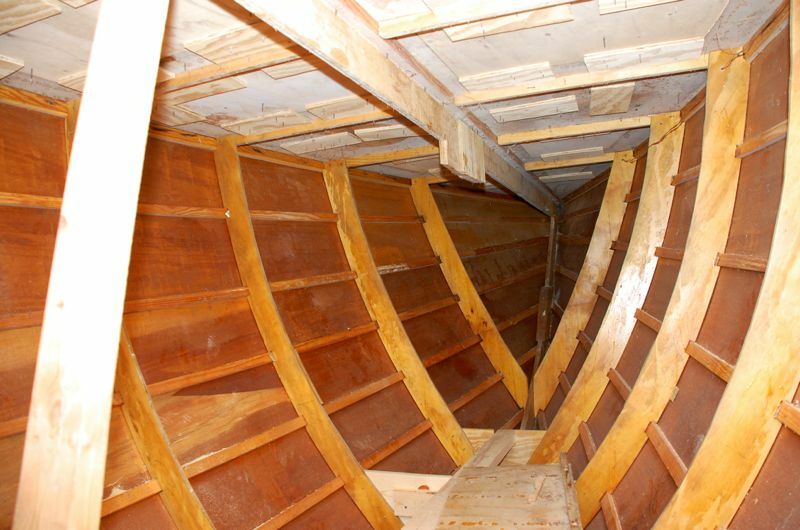 To keep the resulting structure dry and add rigidity, he sheathed the hull with fiberglass. Audacity’s aft compartment. The metal beams connect the outriggers to the main hull. This area traditionally houses a vessel’s steering gear. Not so Audacity. She has no rudder. Jim plans to steer the vessel using outboard motors, one mounted on each side of the vessel. Jim stresses Audacity is a prototype for what he hopes to be a line of commercially built vessels. As such, she is cluttered – a work in progress. Here, below the companionway, the proposed site for a galley. Jim steps in to Audacity’s forward compartment. His hand is on one of the bulkheads that will separate the head compartment from the rest of the cabin. 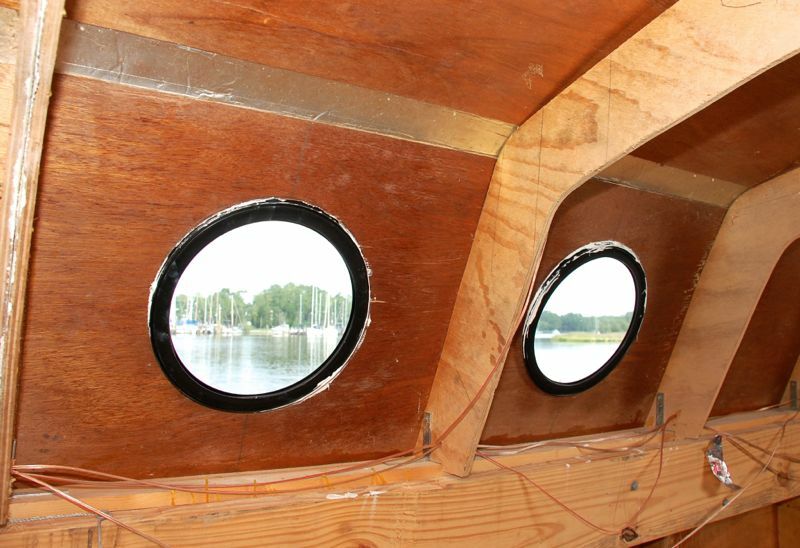 The bow compartment showing Audacity’s plywood frames and luan sheathing. 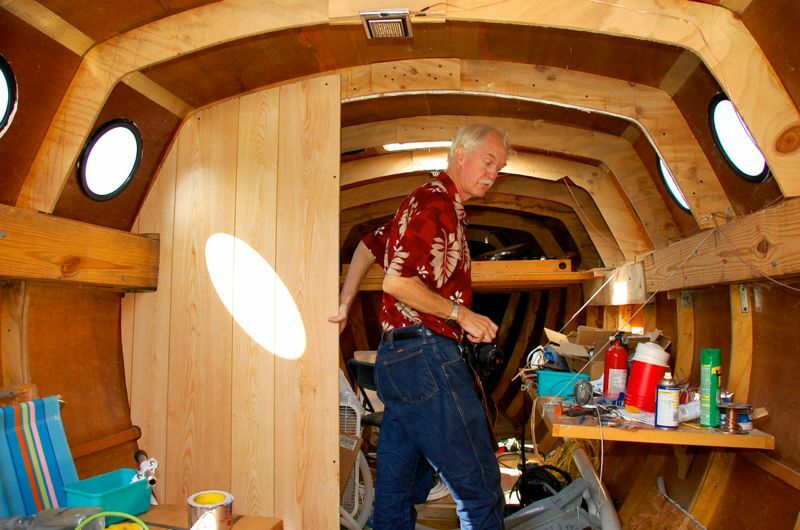 Jim plans to fit out the space with an anchor locker and a berth. To control costs, Jim used materials not normally associated with marine use. The vessel, after all, was a concept vehicle. “You don’t want to spend all your money on the prototype,” he says, “because that wouldn’t leave anything over for production.” If the concept worked, he hoped to build the vessels commercially. 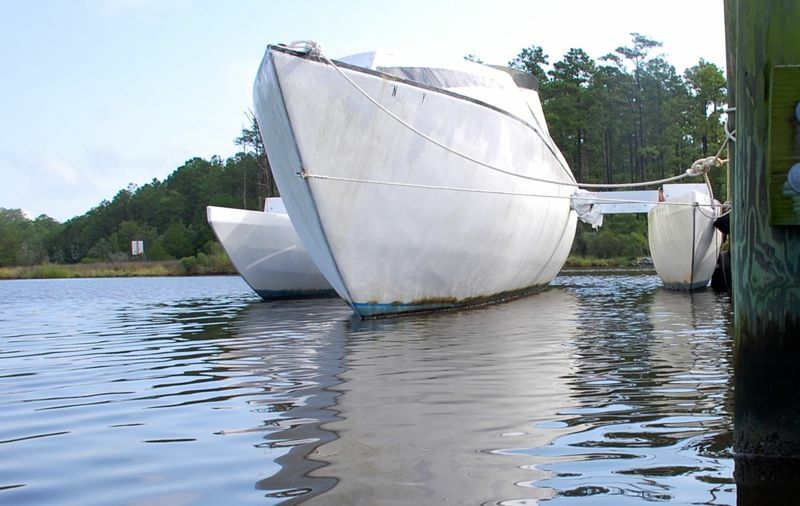 The hull would serve as a mold for future boats. Much of the wood came from building supply stores. The fiberglass cloth and polyester resin – used to give the wood an external, water proof skin – he bought directly from the manufacturer. “I used three, 55-gallon gallons of resin,” he says of the construction, “which I’d say weigh about 1,500 lb. Jim found an inexpensive substitute for bronze ports. “I used van portholes,” he says. “They cost forty dollars each.” He sealed them in place with marine caulk.